North Korea says it is forging ahead with a planned rocket launch this month, perhaps as soon as Dec. 10, drawing strong condemnation from U.S. officials who view the act as a thinly veiled ballistic missile test. "A North Korean 'satellite' launch would be a highly provocative act that threatens peace and security in the region," officials with the U.S. State Department in a statement. North Korea's state-run Korea Central News Agency said Saturday (Dec. 1) that the country will launch a long-range rocket between Dec. 10 and 22 from its Sohae Satellite Launch Station near the northwest village of Tongchang-ri. 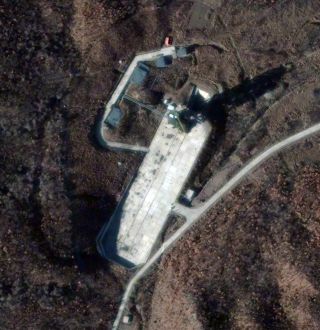 A photo of the launch site from space released last week by the commercial satellite imagery company DigitalGlobe showed striking similarities to North Korea's work ahead of its failed Unha-3 rocket launch in April. "Devoting scarce resources to the development of nuclear weapons and long-range missiles will only further isolate and impoverish North Korea," State Department officials said, adding that the launch violates United Nations Security Council resolutions. "The path to security for North Korea lies in investing in its people and abiding by its commitments and international obligations." In South Korea, a Yonhap News Agency report cited an unnamed senior government official as saying the upcoming rocket launch is aimed at celebrating the one-year anniversary of the North's new leader Kim Jung-Un, who took power last year. In April, the country launched a three-stage Unha-3 rocket (the name means Galaxy-3) carrying the Earth-observing satellite called Kwangmyongsong-3, which translates to Bright Shining Star-3. The mission was highly touted by the North Korean government, but failed shortly after liftoff, prompting a rare public admission of failure by the country. North Korea's Unha-3 rocket is 105 feet (22 meters) tall and is designed to carry payloads of up to 220 pounds (100 kilograms) into orbit. South Korea is also currently preparing to launch its own rocket mission using its Korean Space Launch Vehicle 1. The rocket will launch from South Korea's Naro Space Center, about 300 miles (482 kilometers) south of Seoul. Two attempts to launch the satellite-carrying rocket have been delayed by technical glitches. The mission marks South Korea's third rocket launch attempt. The first two attempts, in 2009 and 2010, ended in failure.